Deadly Tornadoes Remain Hard To Predict Short-term forecasting of twisters like the ones that swept the South this week has grown increasingly accurate. But long-term forecasting remains highly unreliable. Meteorologists are working on ways to improve that. 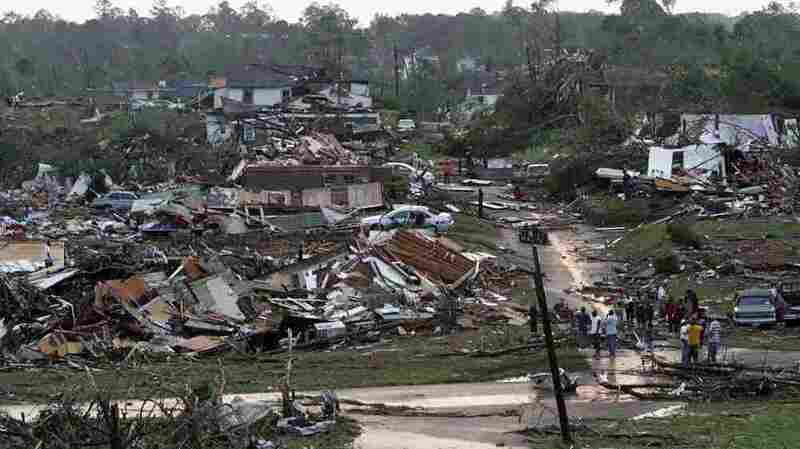 Two days before hundreds of deadly tornadoes swept through the South on April 27 and 28, meteorologists were telling people in that part of the country to get ready for powerful twisters. But those same meteorologists have no idea whether there will be a similar outbreak of tornadoes next week or next month. "This could be it for the rest of the season or it could continue to be crazy — we absolutely don't know," says Howard Bluestein, a professor of meteorology at the University of Oklahoma. That's because even as short-term forecasting of tornadoes has grown increasingly accurate, long-term forecasting remains highly unreliable. One reason for the uncertainty is that a tornado requires a whole lot of things to come together in just the right way: a collision of warm and cold air, powerful thunderstorms, a massive updraft. And it's very hard to know more than a day or two ahead of time whether all those things are likely to occur. Even so, meteorologists are working on ways to make long-term predictions about tornadoes. One factor they're looking at is La Nina, a climate pattern in which water temperatures in parts of the equatorial Pacific Ocean are cooler than normal. The better-known El Nino pattern has warmer-than-normal water temperatures in this part of the Pacific. "La Nina tends to favor stronger, longer-lasting tornadoes," says Marshall Shepherd, a professor of Atmospheric Sciences and Geography at the University of Georgia. La Nina also tends to affect the jet stream — a high-altitude air current that flows west to east across the U.S.-- by shifting it north and west. And scientists have found some evidence that this leads to more tornadoes in states including Alabama and Georgia. Meteorologists also note that La Nina conditions were present during the tornado outbreak this year and also in 1974, the last time so many tornadoes formed in a single month. "However, there are many La Nina years when we don't get big tornado outbreaks," Bluestein says. Also, whatever impact La Nina and El Nino have is too small to allow meteorologists to say whether an upcoming tornado season is likely to be harsh or mild. So scientists including Shepherd are looking for other ways to forecast. One possibility is looking at soil moisture levels, he says. He's done research on the Southeast suggesting that "when there are drier-than-normal conditions in the previous fall and winter, we see below-normal tornado days." That's the number of days on which tornadoes occur. But meteorologists say it's likely to be many years before they can make accurate tornado forecasts more than a few days ahead of time.